18' Extra Huge Saturn Inflatable Heavy-Duty Boats with Aluminum Floor. 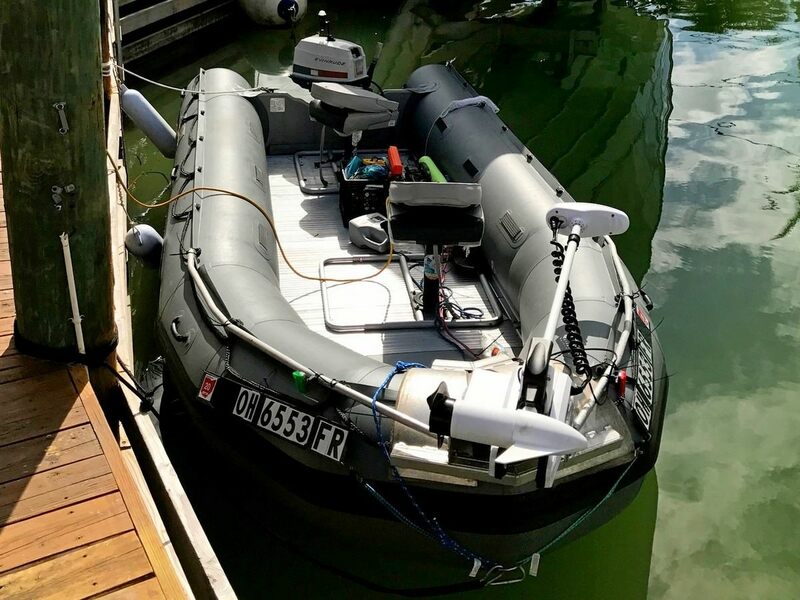 The 18' Saturn inflatable boats SATURN SD518 are our largest vessels. It comes with aluminum floor and Its ready to be used as commercial work boat, for fishing or diving, or just a pleasure day on a a water. The SD518 is a latest addition to the SATURN line of high performance heavy-duty inflatable boats. 18' SATURN SD518 inflatable boats are made from heavy-duty quality PVC fabric, and can handle up to a maximum of 10 persons. Deflated, the SD518 boat will fold to the size of one large and heavy bag with tubes and another large and heavy flat bag with a floor. 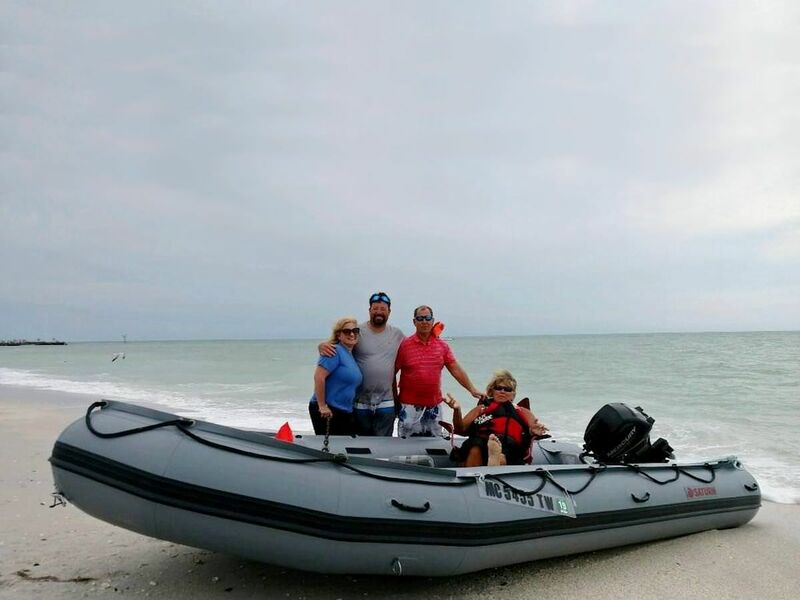 Once deflated and folded, the SD518 inflatable boat can be stored in the back of your SUV or minivan, large closet of your apartment or in a garage. Double layers of fabric at the bottom of the tubes and a rub-strake protector along the keel provide extra protection from sharp rocks and abrasive sand. The safety valve will prevent excessive air pressure in the boat's chambers. Grommet splash guard with grab safety rope moved off-center to create comfortable seating surface on top of oversized tubes. 18' SD518 inflatable motor boats come equipped with with a sectional heavy-duty aluminum floor. The bow section is made of a marine grade plywood floor covered with a gray resin. Aluminum floor installation steps are here. All around rope grab line. 3 one-way drain valves with plug. Holds up to 10 persons maximum or 6 comfortably. Heavy-duty marine grade aluminum floor is included. Extra thick heavy-duty marine grade plywood transom. Equipment: repair kit, 3 seat benches and carry bags. For the list of optional available Accessories please click here. Video of SATURN SD518 with 25HP Motor. Quick Tip! Worried about the heavy weight of a hard floored boat? Don't break your back! Get a foldable hand cart from any retail store to carry the folded boat around. Even inexpensive dolly movers will work great for transporting a folded or fully inflated boat. Get dinghy dolly wheels to easily move the inflated boat across the shore and into the water. 59 x 29 x 14"
48 x 28 x 12"
Note: Specifications and accessories are subject to change without notice. Max O/B Motor means: maximum power of outboard motor that can be safely used to plane the boat loaded to the maximum capacity at normal water surface conditions. Please exercise common sense and caution when using maximum motor capacity. Do not jump from wave to wave as new 4-stroke motors are much heavier then 2-stroke and provide extra strain on the transom. Under normal circumstances, with half the maximum persons/load capacity, 50% of maximum O/B power rating may be necessary to put boat on plane. Bought the 18ft boat 4 years ago. Put a 20hp Honda with hydro foil on it and have been using it in the San Juan’s Islands Washington as the primary boat. Have hauled building supplies, people, garbage, crabbing and fishing in it. It gets used as a pickup. Zero issues and will by another one if I ever wear this one out. Order extra valves and extra proper valve adapter for your pump. I discovered a cracked valve in my new boat which had to have happened in shipping. If I had ordered extra valves this wouldn't be a problem bc they are quite easy to change with the included valve wrench. Store covered or indoors especially warm days. The boat will get very taut from air expansion in the sun. The boat assembly is a 2 man job. The aluminum decks are very difficult to install alone. Very. Great customer service from Eliot who responded promptly to emailed questions. Service gets 5 stars. Enormous inflatable! I was able to get 5 grown men on my boat with fishing gear. If you are planning to take a lot of people out on this boat, you should at least have a 20HP engine. The 18ft only comes in dark gray. My friend also bought one after he saw mine. I wanted a big boat that wouldn't break the bank. I purchased the SD518 to take my friends out in the water. We are usually four, so we have a lot of room to spare for supplies. Since this is such a large boat I keep it under a boat cover to protect form the sun. Overall it's a good boat that has not given me any problems. I’m a scuba diving instructor who owns my own business. I do pretty decent, as I’ve been in the business for a long time and get lots of referrals. I really love owning the company, but I’m a small business, so I need to keep expenses to a minimum. As you could probably guess, the boat I take people out on is really my biggest expense. We all know how expensive upkeep on boats can be, but for me, I can’t just get rid of mine. I need it for my work. Long story short, a scuba buddy of mine told me I should consider an inflatable boat from you guys. I checked out your site, and ended up taking the plunge and buying the SD518. At 18 feet long and pretty wide, this thing can handle all the gear for me and my students. It’s light, so it saves on fuel, which is another one of my main expenses. It’s also very tough. At first, I was scared I’d pop it, so I would be very careful setting down my equipment inside it. Now, I just toss the gear in like I would on my old boat. Honestly, I can’t really even think of anything I can’t do with this boat that I could do with my old boat. More colors would be great please!! The boat is huge, so if you plan to take it around with you , buy a trailer! I was able to add seats and rod holders to make this boat even better. occasionally I need to fold it up and it fits in my truck! The Saturn SD518 inflatable boat you guys sell is really worth the price. I paid like $1,700 for it including shipping. Once I used it a few times, I knew it could meet all my needs, so I sold my old Mako Sportsfisherman for like $8k. I also save a ton monthly on storage and cleaning because my Saturn fits right in my garage without taking up any space. I owned boats my whole life, and I never even really thought about buying an inflatable boat. My neighbor had one, and I was laughing about it. He took me out fishing on it one day, and it blew my mind. The experience is basically the same as a hard-hull boat if you just want to go out cruising or fishing. It’s comfortable, handles well, and is so easy to store and clean. 16 feet is plenty long for me and my whole family. I use the aluminum floor it came with, and the thing is sturdy. But it’s also very light, so the little outboard I stuck on it gives it plenty of juice, even with my whole 5 person family riding in it. When I got my boat, one of the floor boards was cracked due to The carrier throwing the box around. Boatstogo was able to send me a new floor without any issues. Once I was able to put everything together I was able to enjoy this boat. Its big, and has a lot of room. I just put on a 25HP and its enough for me. Great boat, better customer service.